It seems like just about everything today is controlled by computers. In order for them to run they require computer hardware. That hardware is designed and built by hardware engineer. So in reality hardware engineers are some of the most important people in the modern world. Without them the world would look and work much differently than it does today. 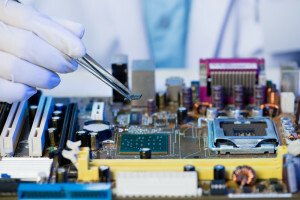 Hardware engineering is the development, designing, building, and testing of the parts of computers and computer systems that you can see and touch. The engineers also supervise the manufacturing and installation of the hardware to ensure they meet the exacting standards necessary for them to function properly. Hardware engineering has led to the development of the circuit boards, computer chips, keyboards, printers, and other accessories needed to use the computer. People working in this field are also responsible for continuing to improve the technology to meet the changing needs of people that use the computers. Another very important role of engineers that work with computer hardware is to make sure the machines and systems continue to work at their optimal level. Without this type of engineering much of the technological progress in a wide range of modern industries would come to a grinding halt. The development of this field has made it possible for modern man to overcome many of mankind’s biggest problems here on earth and launch them into outer space. Without the hardware these engineers create, exploration of the depths of the oceans and traveling to the moon and beyond would remain but a dream. Many breakthroughs in medicine, communications, the automotive industry, home appliances, and more owe their existence to advances in the development and creative use of innovative new hardware engineers have come up with over the past few decades. People look at the rapid advancements and acknowledge they are driven technology. But it’s more specific than that. It is the computer hardware perfected by hardworking engineers that has made much of it possible. The engineers that develop computer hardware have a more wide ranging job than many people realize. First of all, they must research, envision, design, and develop the computer hardware. Next they have to test the hardware they develop. This is a complex process that requires the engineers to provide their team members with the technical support they need. That includes identifying shortcomings in the hardware, defining it, and guiding their team through the process of taking the coordinated action necessary to make the appropriate changes. They also have to document their actions, changes, and test specifications. Other roles of hardware engineer includes designing and creating prototypes. A very important part of that process involves proposing the necessary design architecture and overseeing the execution of the design. Evaluation of the completed prototype is also important. After careful analysis to identify and rectify issues with the hardware, and conduct validation tasks, they prepare a report for their department head. This means these computer engineers are required to have superior technical and communication skills. Another responsibility they have is to share information and advice about acceptance criteria and life cycle support characteristics with their colleagues. They must also create specifications for the devices, collect and share performance numbers from the hardware, improve the device’s reliability, perform failure analysis using their technical expertise, and actively participate in company meetings where they present reports on progress being made and problems they have encountered. The engineers also have to give estimates on when the devices will be ready for use. Creating hardware is a never ending cycle. No sooner have the hardware engineers completed work on a device and it is ready to be released into the marketplace, they must begin brainstorming on ways to improve it. That means coming up with innovations to make the hardware smaller, faster, more powerful, and less expensive. Using all the resources at their disposal and working within the company procedures and guideline, the engineers must begin redesigning the hardware and using their engineering knowledge and special software to create projections and simulations for the capabilities of the new hardware. Working in this field is very exciting. To succeed it requires, vision, creativity, and technical knowledge. Begin as early as possible doing independent research on ways to solve some of the many issues engineers face as they design and develop new, better, more efficient and effective hardware. In term of formal preparation, many companies require people looking for an entry level position in the field to have at least a bachelor’s degree in computer engineering, electrical engineering, or related fields. Some people that are serious about working in the field go through internships or volunteer their services at laboratories and other facilities involved in hardware development. This gives them the advantage of having experience and intimate knowledge in addition to their college degree. Many employers prefer applicants with experience in the industry or those that have spent time working on high-quality hardware projects on their own. It also helps if the applicant has a clear understanding of the relationship between hardware and software. The ability to prioritize project requirements and to multitask is also highly prized. Some other career requirements include having advanced skills in mathematics, possessing excellent analytical skills, and being able to work as part of a team. Being able to focus on several projects without requiring much supervision is also highly prized. Applicants that demonstrate the ability to present complex engineering concepts in easy to understand terms to other engineers as well as laymen are also more likely to get hired. Add strong interpersonal skills and many doors will be open to you. Applicants with experience in and knowledgeable of both hardware manufacturing and installation often can find work in research laboratories or in private industry. There are lots of companies looking for qualified candidates with the ability to design and develop microchips, circuit boards, and other hardware components. Spend some time working on projects of your own or volunteering at local schools to help with hardware development projects. This will make your resume stand out and improve your chances of landing a position. The job requirements for working as a hardware engineer are pretty straightforward. Candidates should have a Bachelor’s degree in electrical or computer engineering or a closely related field. It helps if you have completed coursework in advanced mathematics, physics, computer systems and networks, hardware design, electronics, electromagnetics, and statistics. Courses in software engineering are also looked on favorably. It is also essential to enroll in a degree program that is Accreditation Board for Engineering and Technology, Inc. approved. Getting certified through Cisco Systems, Microsoft, and other trade organizations improves your chances of landing a job. Earning these certifications often entails mastering several computer languages. This is a plus when trying to break into the field. Some states require hardware design engineers to be licensed. Acquiring the license necessary to work in your state improves your chances of getting a good job. Having a graduate degree makes you a more attractive employment candidate particularly for companies involved in research and development. The coursework required to earn a Master’s or PhD in computer engineering usually includes computer architecture, computation applications, and advanced algorithms. These courses are very helpful in hardware engineering. This can also give you an edge in the job market. Hardware engineering is a very lucrative field. Starting salaries tend to be around $68k a year for entry level positions. People with a few years experience can easily earn in excess of $88k annually. Experienced engineers can reasonably expect to earn between $130K and $145k. The median income for people working in this field is $112,768. These positions often offer profit sharing and bonuses which can be as high as $10 and $15k respectively. They also offer several thousand dollars annually in medical benefits and other perks. Besides experience, there are several other factors which determine the salary a hardware engineer can reasonably expect to command. Two of those factors are the size and type of firm with which you work. The city in which you work also makes a significant difference. Hardware developers in Cupertino, California make 45% more than the national average. Firms in Mountain View, San Francisco, Boston, and Santa Clara all pay above the national average. Firms in Dallas, Houston, and Denver pay up to 22% below the national average. You earn an excellent salary. There are job openings all over the world. Your work can positively impact millions of people every day. You might become involved with some most advanced projects on earth. You spend most of your time indoors in a laboratory. It can be a high stress profession. The demand for workers can fluctuate wildly. Having a master’s or a PhD improves your job prospects and your salary. Most hardware engineers are employed by computer development companies, but private industry, government agencies, communications companies, and academic institutions are always looking for qualified hardware developers. Expand your job search. While you are searching for a job, you should also take continuing education course to stay abreast of the new trends in the industry.